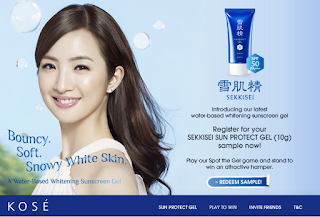 Singapore Freebies: KOSÉ: Free New SEKKISEI Sun Protection Gel Samples Giveaway!! KOSÉ: Free New SEKKISEI Sun Protection Gel Samples Giveaway!! Bouncy. Soft. Snowy White Skin. KOSÉ is proud to introduce the new SEKKISEI Sun Protect Gel. without messy and greasy applications! Play Spot the Gel game and stand to win an attractive hamper. Moisture components such as oriental plant essence are fully compounded. Penetrates easily with cool and enriched texture, leaving skin moist on the inside and smooth on the surface. Sun protect gel made with oriental plant lotion that creates smooth and translucent skin by preventing spots and freckles caused by sunburn. Thin and light oil with enriched and gentle usage feel and high penetration grants smooth skin without becoming sticky. It is so comfortable it feels like bare skin, and you will forget you are wearing it.